WE DESIGN to your needs. 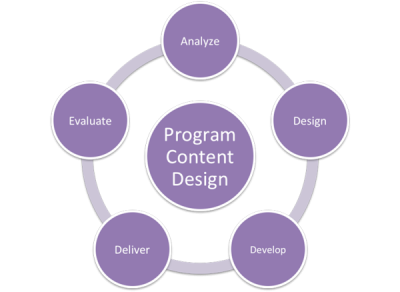 We utilize a structured instructional design process in order to create and deliver client programs, as well as make post-design and delivery updates. Our design philosophy is simple: we believe that the goal of every instructional design project should be to deliver on outcomes in the shortest amount of time, using the most appropriate methodology, so that those participating can perform as expected and required once they have completed the training. To ensure our clients select, create and implement the most effective solution possible to achieve results, we use a systematic, proven and “real world” design cycle. This design cycle has five phases, each with a specific purpose. Phase What is it? How is it done? Analysis Analysis can include examining organizational culture, existing systems, materials, and data, employee skill and motivation levels, management practices, project constraints such as budget, time and learning environment. The results of the analysis are critical to implementing a realistic and results-oriented program or process. Analysis can take the form of corporate literature reviews (of training and other materials), employee and management interviews, assessments, surveys and multi-rater reviews. In a redesign of a program or process, we focus on what is currently working (to maintain these areas) and what isn’t (to upgrade these areas.) Up to eighty percent of design time can be spent in this phase. Design Design of solutions can include completing task analyses, outlining content, defining objectives, selecting learning applications, planning delivery and evaluation methods. Design is most often completed using data and information gathered through analysis. A solution is created that fits the parameters of the client and the problem. Most importantly, it fits with other initiatives currently in place at the company. Delivery Delivery is the implementation of previously designed and developed performance solutions. Delivery includes rollout of ongoing assessments, implementation of newly designed processes and procedures, communication of new standards, individual coaching and training of end-users or trainers. Evaluation Evaluation is an often-avoided and reluctantly completed step in design. Essentially, evaluation occurs after delivery of the solution; its only goal is to ensure that the chosen and implemented actions met their intended objectives. The level of evaluation is always planned for in analysis. Evaluation can be completed through observation of the initial program offering, re-surveying and assessing the target audience, reviewing program evaluations or pre- and post-tests, conducting interviews observing employees’ behavior on the job and debriefing pilot sessions.